Our goal was to address a problem that people faced at the airport through ubiquitous computing. After field research at the airport and user needs validation, we came up with Bag Buddy. Bag Buddy tracks your luggage throughout the airport, using sensors embedded in your bag’s luggage tag. It provides a real-time estimate of when your bags will arrive at baggage claim, giving you the freedom to use your time more effectively. We wanted to give people the freedom to explore an airport instead of having to wait for luggage at baggage claim. Do I have to check this bag? We came up with over 50 ideas from bodystorming and brainstorming. After these brainstorming sessions, we picked our top 5 ideas and drew out storyboards for each concept. To better understand the needs of the public, we conducted "speed dating" sessions at local coffeeshops, parks, and offices. We walked our participants through the 5 storyboards we created and had a discussion with them about whether or not it was something that they would use. At the end of each session, we had the participants rank the storyboards from most to least favorite. 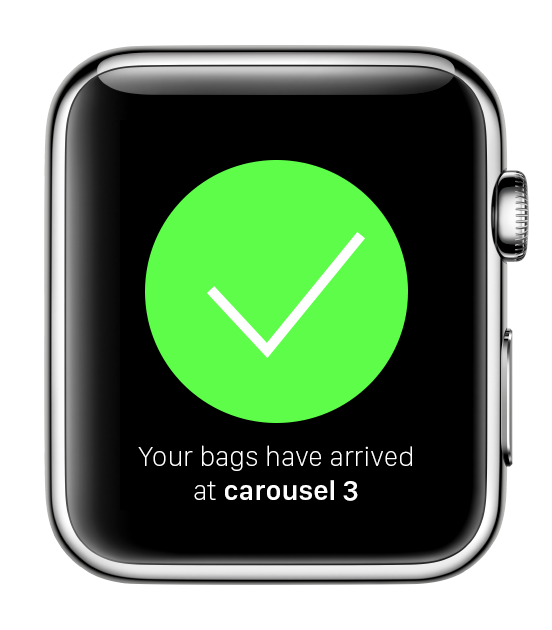 We found that the overwhelming winner was Bag Buddy, which tracks your checked luggage and lets you know when it arrives at the baggage carousel. In the original storyboard, Bag Buddy was a chair that would alert you, but our participants said that they would want to have the freedom to be wherever they want as opposed to be stuck in a chair in order to use the system. With that in mind, we pivoted and changed the way that we addressed the issue of knowing when your bags would come. 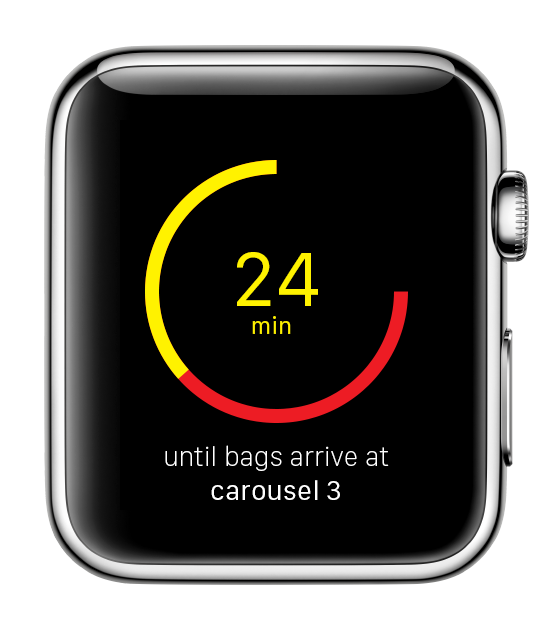 We decided to design an Apple Watch application that would keep track of your bag. We wanted to use the Apple Watch interface because it makes a lot of sense for this issue to be solved through the watch interface. The user is only giving the watch quick glances to check on the time, and the Apple Watch lends well to the idea that this is an app concerned with time. 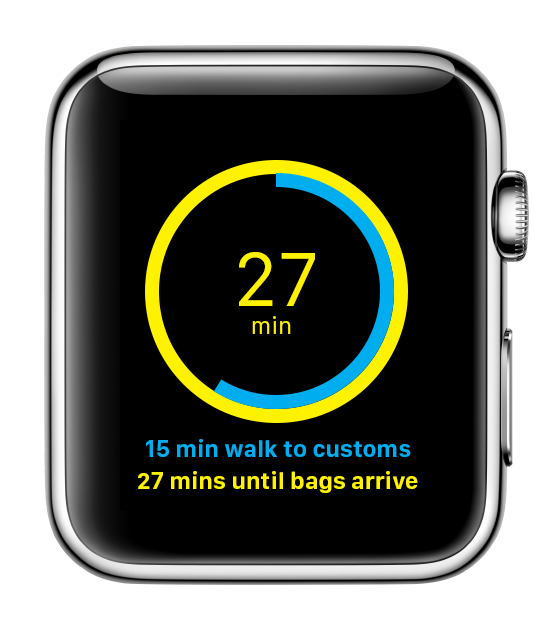 On the main Bag Buddy screen, you can see how long it will take for your bags to arrive at the baggage carousel (in yellow), and how long it takes for you to get from your current location to customs (if applicable). The timer provides real-time estimates. When there are delays in transporting luggage from the airplane to baggage claim, Bag Buddy will notify you of the delay through an alert and provide a new time estimate of when your bags will arrive. Bag Buddy will give you alerts starting when your bags are 5 minutes away to ensure that you get to the baggage carousel when your bag arrives. We observed at the airport that many people have the similar or even the same luggage items. People would take luggage off the carousel only to find that it wasn't theirs and have to lug it back onto the carousel. Bag Buddy makes checking to see whether or not it's your bag more effortless. You simply hover your watch over the luggage, and if it's yours, the watch will glow green. If not, it will glow red.